Severe Bass » More Gardening! In the world of growing food, things move relatively slowly, with spurts of advancement. Sometimes those spurts are unnoticeable, however sometimes they are obvious. Like when I spend 3 hours back there, as I did today. I moved and I shook, I hustled and bustled, and there is some activity going on! That's spinach and cilantro in the far bed, mascara lettuce in the closer one, and each cell pack has either basil, kale, or cherry tomatoes. Behind that is the patch of oregano I transplanted a few weeks ago. I ended up moving out the tomatoes that were in the bed a couple weeks ago into the ground. No pics on that yet, but the plants look like they’re taking root (which is good b/c I think I moved them about a week earlier then I should have). The rain this week has helped I’m sure. When they get some strength to them I’ll update ya! Also put in the ground were my lettuce seedlings. These seeds were really prolific so I had more sprouted seedlings then I expected. 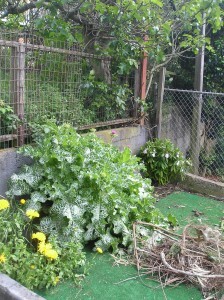 However after a few days later, what was a very crowded garden bed no longer looks so overrun with potential plants. This here is mostly Crisp Mint, although I think a few Yugoslavian Reds survived…. 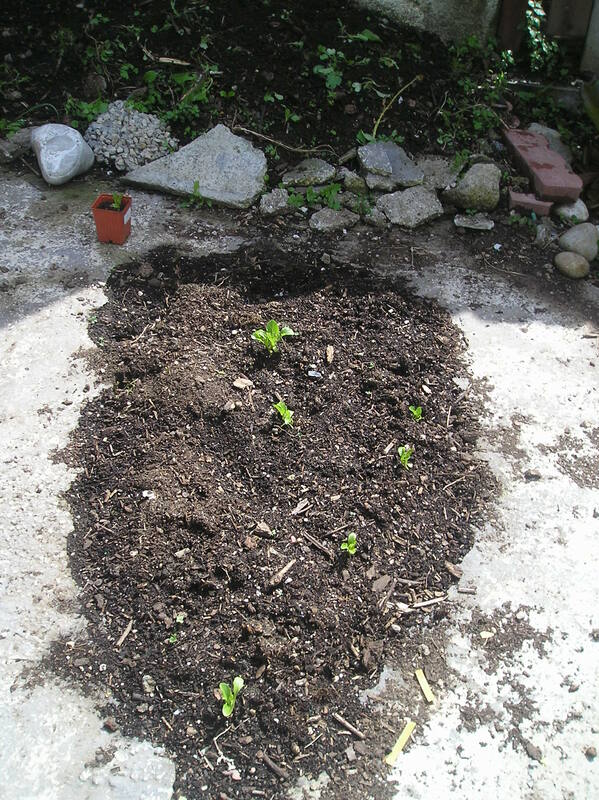 Behind that bed is a lot of junky soil (read, there’s concrete and glass mixed in), that I planted some Morning glory seeds in. I hope to have them climb the fence behind it. First I’ll need to get the seeds to sprout and then guide them up there. Luckily I cut some branches off of a neighboring fig tree which I think I can use. On that, I had to move the plant that came back to life b/c it was in prime tomato space. 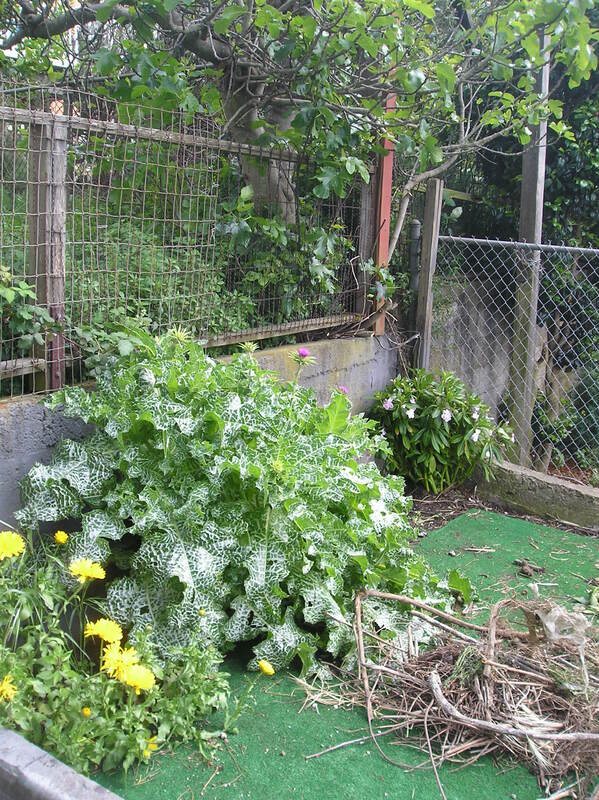 The far back of this side of my backyard is quite plentiful w. some sort of yellow flower, milk thistle, and now said plant! The fig tree was encroaching on the area where the plant currently is (note to self: figure out what that damn plant is called!). It’s hard to believe all that milk thistle came out of 3 or 4 seedlings I started from some seeds from the food coop. Better yet, it’s starting to bloom finally so I can harvest the seeds soon! Then I’ll trim the plant back pretty rigorously. In case you’ve never come across milk thistle, it’s sharp and pointy, and grows like crazy. The next update will be awesome. You’ll want to read it. And maybe I’ll actually write about something other then gardening in the meantime! 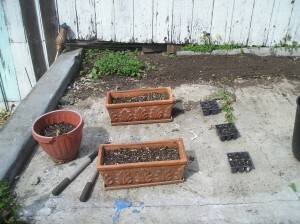 Mapping out my Backyard (short post): Backyard Work Continues!